I always thought that the Egyptian hieroglyphs or the yet undeciphered Meroitic alphabet were not the only signs of ancient writing in Africa. I also always thought that there were other forms of writing throughout Africa, and not just in the northern part. So I was happy to hear Saki Mafundikwa, the founder of Zimbabwe‘s first graphic design school and new media, talk about his book Afrikan Alphabets: The Story of Writing in Afrika, which is a comprehensive review of African writing systems throughout centuries. Mafundikwa left a very successful career in New York to return to his home country and open this school, so as to inspire the newer generations of African designers to look inward (to their own rich cultures) as opposed to outward (toward Europe) as they have done in the past decades. He sums it up so well in his favorite Ghanaian glyph, Sankofa, which means “return and get it” — or “learn from the past.” It is refreshing to learn about these systems, from simple alphabets to secret symbols, from the Adinkra of Ghana, to Mende, Vai, Nsibidi, Bamum, Somali, and Ethiopian scripts which date back centuries. It is above all refreshing to realize that Africans have their own way of thinking which can be perceived in their designs, and that ultimately graphic designs date as far back as the ancient Egyptians and can be observed throughout Africa. Take the time to read Saki Mafundikwa in his own words. Enjoy Saki Mafundikwa’s speech at one of the TED conference. Very Interesting. I will share information about Saki’s book on my website as well. Saki Mufandikwa’s talk is fascinating and does much to redress false notions about the cultures of the African continent and their inherent conceptual sophistication. Not only do young Africans need to look within to find their sources of inspiration, but those outside Africa could learn a very great deal about the nature of human existence by looking in the self-same place, that is inside Africa. And by the way, this is a great blog. Thank you for visiting the blog, and for your kind comments. 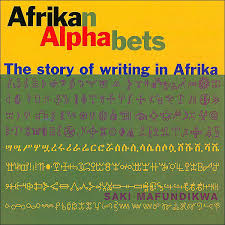 Over a decade ago, Mufandikwa sent out PDF sample pages of African Alphabets on the Black writers’ email list e-drum. I kept and treasured that file. Years later when I got a gift card for a big online bookstore, I used it to buy the book. I wish I could thank the author personally. Wow… that is lovely: to be privy to sample pages of the African Alphabets book years before it came out. That is so special! OMG, I’m only seeing this today, January 22, 2018! Thank you Stephani Booker, this is such a sweet sentiment! You can reach me at sakimaf@gmail.com. Asante Sana. Dear Saki. Thank you for commenting on my blog. I feel quite honored for your comment., and am so grateful for your work which is inspiring so many of us in Africa. Your work is for posterity! Keep up the great work! To Mr. Mafundikwa: I just wrote to you! To Dr. Y., the author of this blog: Thank you for keeping this means of connection among thinkers of African descent alive! Oh Wow! Stephani, I am so glad you could connect with Mr. Mafundikwa. I am so glad that the blog could help with this. Thank you for commenting. Professors Cheikh Anta Diop & Ivan Van Sertima did research on writing systems of the Motherland also. You are absolutely right! Thanks for commenting. Yes, brother, and those two titans are huge heroes of mine.